Using a variety of media, MA Fine Art Students from the University of Kent’s School of Music and Fine Art attempted to show “a piece of themselves” through a range of themes; from culture and identity to narrative and perception. These themes manifested themselves in a variety of ways; from tactile sculptures, which you were invited to touch, to a documentary detailing secret tunnels in Kent that are on the brink of collapse, to an exploration of cultural identity within the British Asian Community. Within the space, visitors found various opportunities to find themselves contained within their own experience through using headphones in order to mimic ideas and feelings surrounding ‘a silent disco’ in which participants partook in their own personal experience of the space, one that appeared silent to those looking in but was in fact bursting with sound. The MA artists showcasing their work in this exhibition were all at different points in both their lives and their practice; some are graduating, some are continuing with their MAs next year, some are venturing into new and exciting directions and some are establishing themselves in their chosen medium. This exhibition offered an exciting insight into the range of ideas possible, through art, in our world. 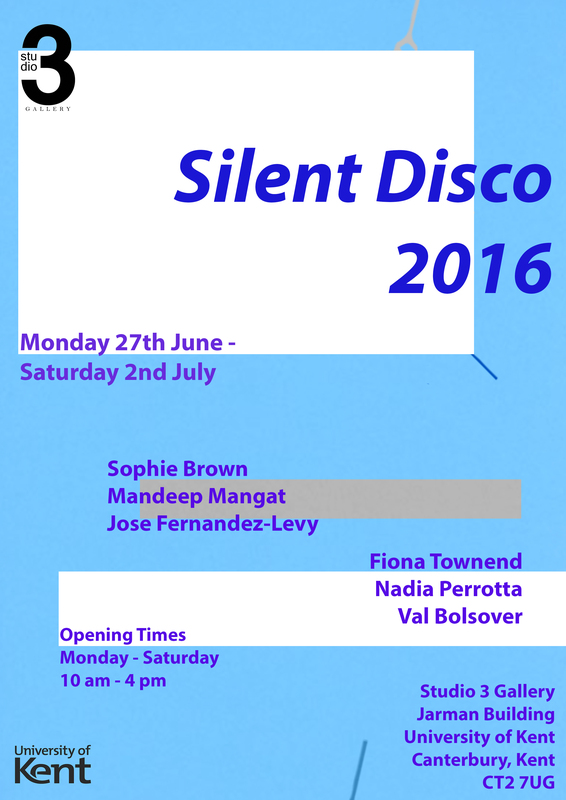 There was no Private View; It was a Silent Disco.